Huge week for BMT as we finish up our adventure through the Friday the 13th series. I’m actually getting a little emotional as I relive our journey from F13 n00bs to veterans of the series and big enough fans to be legitimately disappointed when they scrapped the planned reboot this year. The 11th movie in the series, Freddy vs. Jason, pitted two of the most famous film slashers against each other and earned enough goodwill to not qualify for BMT, so that’s just a bonus this week. As for the Bring A Friend for Friday the 13th we went with Black Friday the 13th, pairing a Bargain Bin C-list Gary Daniels martial arts film, Black Friday, with the conclusion of the horror franchise. There had been some questions for as as to what qualified for “Bargain Bin,” but this certainly does: stars a C-list actions star, does not have a trailer, and was directed by the same guy who made Saving Christmas. That is legit lower than Direct-to-DVD… that’s like Might-not-ever-be-on-DVD level. But of course my local public library had a copy ready to rent (my library is amazing). All things considered I’m willing to bet watching Black Friday will be a more horrifying experience than finishing up Friday the 13th. Let’s go! Leonard Maltin – 1.5 stars – The 12th Friday isn’t a sequel but something like a remake of the 1st and 3rd. As before, some annoying teenagers encounter the silent, murderous Jason, who chops, stabs, and bludgeons his way through the cast, though without as much gore as in previous entries. Plodding, dull, and repetitive, this is only occasionally creepy and never scary. Yes, there’s a setup for a sequel, if anyone cares. Rotten Tomatoes – 25% (42/166): Though technically well-constructed, Friday the 13th is a series rehash that features little to distinguish it from its predecessors. Notes – The first time Paramount has any association with the “Friday the 13th” series since 1989. Adrienne King, star of the original 1980 film, was approached by producers Andrew Form and Bradley Fuller to do a cameo appearance during preproduction. A few days later, the producers called her back and told her they didn’t want anyone from the original film to appear in the remake. (This production sounds organized). The first film in the series released by both New Line Cinema and Paramount Pictures. Originally, Paramount owned the rights to the series after the original was released in 1980 but sold the rights to New Line Cinema in the early 1990’s after poor box office returns of Friday the 13th Part VIII: Jason Takes Manhattan (1989). 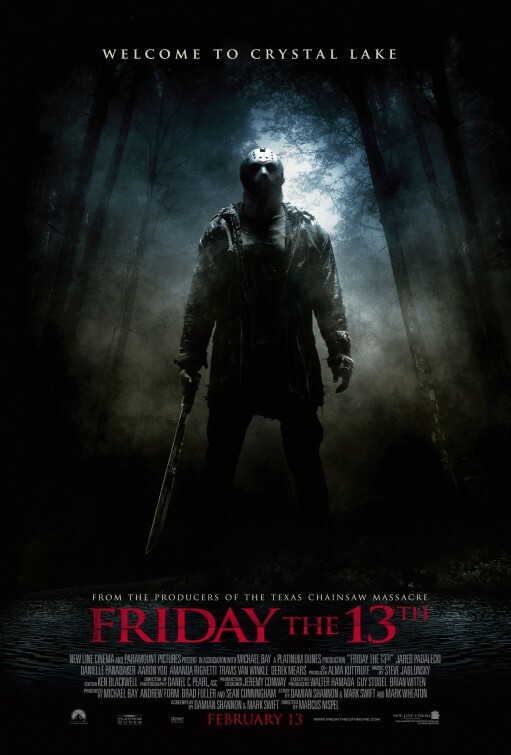 New Line bought the rights to the characters of Jason Voorhees and Pamela Voorhees, the Crystal Lake name, and the trademark for the title “Friday the 13th”. All footage from the first eight films and the remake rights for the first film remained the property of Paramount. New Line Cinema released Jason Goes to Hell: The Final Friday (1993), Jason X (2001) and Freddy vs. Jason (2003). When Platinum Dunes came aboard to develop the new film, they wanted the freedom to use scenarios and characters from the films still owned by Paramount. After a legal dispute, the companies decided to co-produce the 2009 film. With $42.2 mil, had the biggest opening weekend of a horror-remake beating out former record holder The Grudge (2004) ($39.1 mil). Tommy Jarvis, a character that appeared in Friday the 13th: The Final Chapter (1984), Friday the 13th: A New Beginning (1985), and Jason Lives: Friday the 13th Part VI (1986) was at one point confirmed by producers Bradley Fuller and Andrew Form of Platinum Dunes to be returning as Jason’s nemesis. (That would have actually been cool maybe, set them up in a trilogy or something to battle it out. I could have gotten behind that). Despite the title, the date the events supposedly take place on, Friday the 13th, is only mentioned once. The date can be seen on a tear-away type calendar in the police station, as the officers leave to investigate towards the end of the movie. One of the victims was originally supposed to drown due to exhaustion as Jason waited her out from the shore of the lake. Travis Van Winkle portrayed the same character from Transformers (2007) which was directed by Michael Bay. The film’s setting (New Jersey) is an homage to the original film being filmed in New Jersey. (Wellllll … Crystal Lake is in New Jersey so easy peasy). Jason just randomly appearing out of thin air as in the earlier films wouldn’t fly this time around. So, they decided he traveled via a series of underground tunnels. That concept was in Mark Wheaton’s original script, but Mark Swift and Damian Shannon claimed to have never read Wheaton’s script until the film was finished, having come up with the same idea about the tunnels on their own. As for the marijuana plant farm which Jason appears to use to lure teenagers into traps, apparently no writer can claim that as their own. According to Swift and Shannon, that was actually director Marcus Nispel’s idea from early on in the development process, and it was their job to work it into the script. (Huh, that could work, but it sounds a bit too over-explainy to me). The character of Sheriff Bracke, played by Richard Burgi, is named after author Peter Bracke, who wrote the book “Crystal Lake Memories: The Complete History of Friday the 13th”. Screenwriters Mark Swift and Damian Shannon wanted Jason’s body count in the film to be just 13 as an easter egg for fans. It was surprising how much work it was to kill thirteen people.” Friday the 13th Part IV: The Final Chapter pulled off the “just 13 kills” thing as well, and Friday the 13th Part VI: Jason Lives writer/director Tom McLoughlin originally turned in a film featuring just 13 kills. Executive Producer Frank Mancuso, Jr. forced him to perform re-shoots to up the body count to 18. (Ha, yeah, 13 is pretty close to typical for Friday the 13th, 18 is a lot). The film takes place on June 13, 1980 and in 2009. Mark Wheaton’s original pitch to New Line was to reboot the series with “a new Part V,” ignoring the original “New Beginning” and everything that happened after while featuring a prologue showing Jason Voorhees witnessing the murder of his mother. The characters who come to Crystal Lake then know of Jason as they did in Friday the 13th Parts 2, 3-D, and IV, but Voorhees is not yet supernatural as he is beginning with Part VI (or is a demon worm, or has gone to space, etc.). To further suit the needs of a reboot, Wheaton had Voorhees in first the canvas bag as he was in Part 2 only to replace it with the hockey mask halfway through the film. The character Richie was one of a few characters to have CGI effects added into his death. Derek Mears (Jason) was holding only the handle with half the blade of the fake machete, making it look like it impaled Richie’s (Ben Feldman’s) head. The visual effects crew digitally superimposed the fake machete to look like it was a completely bladed weapon in the final film. Director Marcus Nispel usually allowed minimal use of CGI effects into his films.